Our guest this week is none other than the mighty Rachel Therrien. 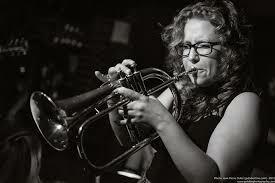 Rachel is an acclaimed trumpeter, composer and bandleader originally from Quebec and now resides in NYC. She has four recordings under her own name and tours extensively with her own group as well with DIVA Jazz Orchestra among others. She is also a member of People of Earth's amazing horn section. In this interview we talk about her career in both Canada and the US, her recordings, her adventures abroad and how she came to be a member of POE.